Alan M. Turing b. 23 June 1912 Father of "Can machines think?" thought experiment. 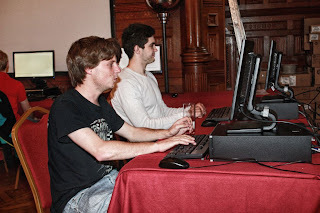 In his honour Reading University hosted a special Turing test event at Bletchley Park on Saturday 23 June 2012. Dr. Vladimir Veselov wins 'The Colonnade' trophy for winning machine awarded by Alan Turing's birthplace, The Colonnade Hotel London in Reading University's biggest Turing test contest at Bletchley Park, 23 June 2012. This weekend marks the centenary of Alan Turing's birth, a man who committed suicide after being persecuted for his homosexuality and played a crucial role in breaking the German codes during the Second World War. Science correspondent Tom Fielden looks at his life's achievements. 1 Day to go to Alan Turing's 100th birthday!